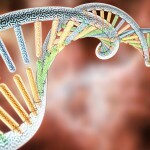 DNA has an energy field that shapes its code. All forms of Energy Medicine have extensive experience with healing by manipulating energy fields. Standard (allopathic) medicine generally balks at this concept. They think in terms of chemical-level interactions along with flows of electrical energy via the nervous system. The concept of an electromagnetic field that interacts with chemical and electrical functions are beyond the pale. Interestingly, there is relatively recent research by a Nobel-Prize laureate who has discovered that there is an intimate interaction between DNA and its local energy field. Luc Montaignier, famous for being the original discoverer of the HIV virus, has published a study demonstrating this interaction. The publication is in Interdiscip Sci Comp Life Sci (2009) 1: 81-90. DOI: 10.1007/s12539-009-0036-7, by Montaignier et al. The Title is: “Electromagnetic Signals Are Produced by Aqueous Nanostructures Derived from Bacterial DNA Sequences”. Personally, I have also corresponded with Dr. Montaignier and heard his detailed presentation at the National Center of Homeopathy conference in 2012. Here is exactly what he has done: Dr. Montaignier took DNA from various viruses and bacteria. Each DNA or RNA solution was prepared by a process of shaking and extreme serial dilution similar to the processes used in the energy medicine system known as homeopathy. Sophisticated frequency spectrum analysis showed that there were bumps in spectra that showed as a result of this succussion and serial dilution. Following a simple procedure originated in the 1990s by Jacques Benveniste, and followed as well by Coherence Apps LLC in preparing eRemedies, Dr. Montaignier extracted the energy and created MP3 files of the frequency spectrum. He then emailed the MP3 files for each virus DNA and bacterial DNA to another laboratory. The receiving laboratory had prepared a solution of nucleotides (building blocks of DNA and RNA). These were just building blocks randomly in solution. When they played the MP3 file for a particular DNA or RNA, the building blocks lined up in sequence — creating new DNA or RNA with exact sequences matching the original! Hence, these complex genomes are intimately connected with their own energy fields which can literally be used to accurately make new DNA and RNA. [MDinyourHand is not solely an information site! Primarily it provides rapid relief for a variety of acute ailments DIRECTLY by using your cellphone or computer! For acute self-limited conditions, don’t forget to use MDinyourHand > Ailments for rapid relief! There are modules for fever, diarrhea, baby colic, even injuries such as back pain or head injury,and childbirth complications. In emerging countries, malaria, typhoid, and cholera. These are only a few of the full modules. Excellent summary of Dr. Montaignier’s ground breaking work! Thank you!